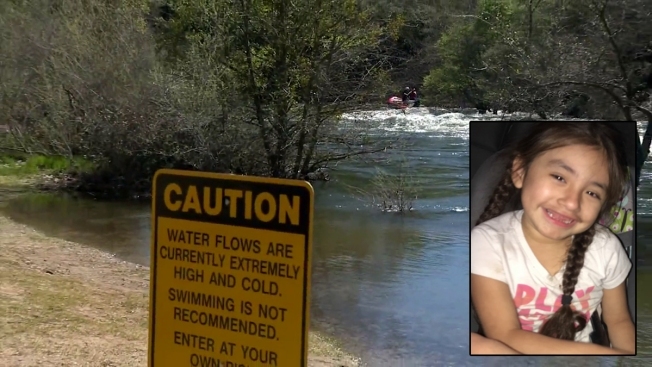 In this story from KCRA-TV, family members and volunteers help Stanislaus County Sheriff's Department employees search the Stanislaus River on Tuesday, March 19 for a 5-year-old girl who slipped into the river on Sunday. Members of the community pitched in to try and find a 5-year-old girl who slipped on some rocks and was carried away by a swollen river in Central California. Matilda Ortiz was with her father Sunday afternoon when she slipped and fell into the Stanislaus River in Knights Ferry. The girl's father jumped in after the child but had to be rescued himself. Deputy Royjindar Singh said one bystander had a grip of the girl briefly before she was swept away. On Sunday, search crews used a boat and a helicopter to look for the girl until darkness but had to call off the search because of the river's dangerous conditions. On Monday, the Stanislaus County Sheriff's Department deployed two boats, a plane and a helicopter in the search, according to KCRA-TV in Sacramento. Volunteers offered to help Tuesday, the television station reported, either by walking the area with family members or bringing water to support those searching. The Modesto Bee, reported the department had scaled back the search on Tuesday and was not sure what resources would be sent out for a fourth day on Wednesday. The girl's mother, Marissa Vasquez, told the Modesto Bee she believed her daughter was gone but wanted her body found and returned to her family. "This tragic event has touched so many people, including the first responders that searched and continue to search for her," the sheriff's department said in a post to Facebook. "Please continue to pray for the family, that we can bring some closure. Our hearts break for them and little Matilda." Knights Ferry is located approximately 40 miles east of Stockton, California along State Route 120.